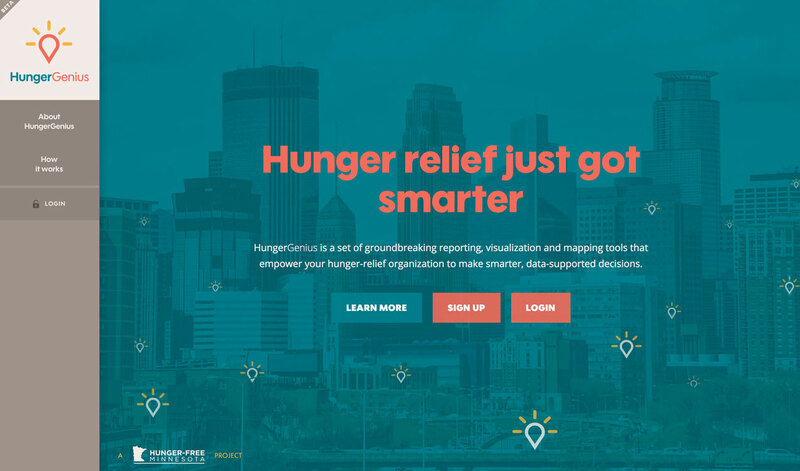 HungerGenius is a set of groundbreaking reporting, visualization and mapping tools that empower your hunger-relief organization to make smarter, data-supported decisions. It combines data and analytics to allow organizations that are fighting hunger to easily navigate through searchable, targeted data, visualize and interpret data clearly and efficiently, use key data insights to increase decision confidence and combine it with organization centric private, encrypted data. Organizations that fight hunger normally lack data and analytics to help them decide where to put their resources, where they can make the most the most different, and where their investments are paying off. HungerGenius is a unique set of tools that combines data into actionable items to reduce hunger in areas where organizations work. It combines intuitive user-centric design with analytics and maps to allow organizations to better target their resources and improve their in their metrics all while being able to track the impacts they are having. The main objective of HungerGenius was to create a system capable of ingesting over 140 raw data sets relevant to scoring hunger relief efforts. The system needed to allow users to define their own geographic regions of interest and add their own data to come up with metrics that will help them better administer their hunger relief services. It needed to allow users to visualize complex data sets in digestible pieces including graphs and maps so as to be able to track change over time and compare themselves to other areas and programs. The HungerGenius system successfully delivered a set of groundbreaking reporting, visualization and mapping tools. It allows users to pick their geographical regions of interest in the geographical divisions that are of interest to them. The data is then provided to the user analyzed at the geographical divisions that they work within. The data is then processed on the fly using a complex algorithm to quickly and efficiently transform data into actionable knowledge.